Radicchio, Chicory in English is a popular ingredient in risottos here in Italy. I have already posted a Risotto with Radicchio which was with Taleggio and Parmesan Crisps, which, if you have not tried yet, than you are truly missing out! 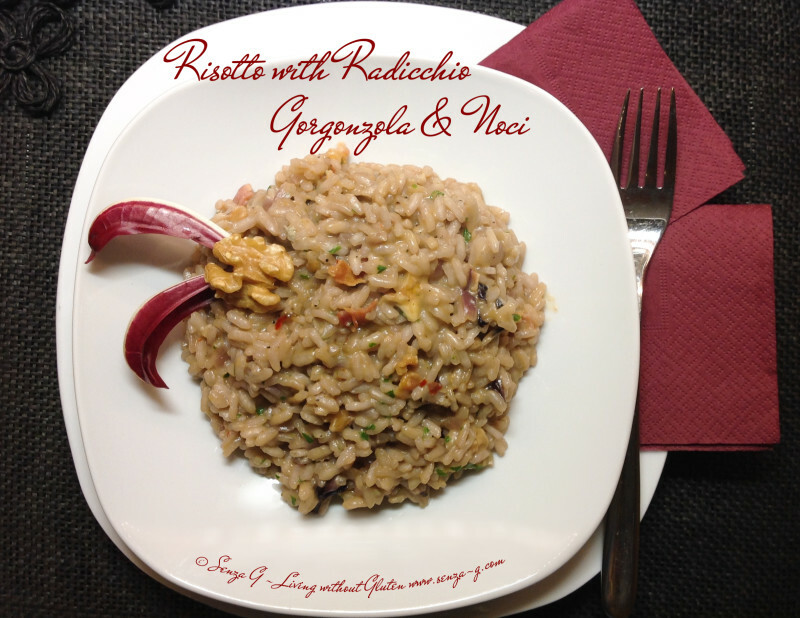 This time, I have made this radicchio risotto using creamy Gorgonzola with the added crunchiness of walnuts. Wash and slice the radicchio leaves in small strips. Set aside a few baby ones for garnish. Boil the remaining for a couple minutes to remove the bitterness. Drain and set aside. Sauté the onion in a little olive until translucent and then add the sliced radicchio and cook for a minute, stirring all the while. Add the rice, stirring until it is covered with the oil. Add the wine which will be absorbed almost immediately. Stir in the minced garlic and add a ladle of stock. As soon as the stock looks almost absorbed, add another ladle. Continue adding a ladle at a time till the rice is nearly al dente. Do not let the rice dry out. It should start to look creamy and of a soupy consistency. Add the chopped Gorgonzola, Parmesan cheeses, chopped sage and a knob of butter. Stir well until the Gorgonzola and butter melt and they are fully combined. Check seasoning, cover and leave for a couple minutes before serving. Serve sprinkled with chopped walnuts and the baby radicchio leaves.